Fred Bear once said, “Nothing clears a troubled mind like shooting a bow.” But you don’t need a troubled mind to go into the woods with a bow and arrow to renew your spirit. The Bear Archery Kodiak Recurve Bow is based on the legendary 59 Kodiak, making it a great choice for the avid hunter who wants a traditional experience. Interested? Check The Latest Prices on Amazon! Mr. Bear started the company that produces the Kodiak Recurve Bow. Although the 59 Kodiak is considered the standard in recurve bows, this re-creation is modeled so closely to the original, it’s like having the legendary bow in your hands. Bear Archery is one of the premier names in archery equipment. They weren’t sure that they could remake the 59 Kodiak, but they wanted to please their customers. This bow is considered to be legendary. It’s 60” with a large profile leather strike plate, a leather grip, a forgiving feather arrow rest and much more. It’s beautifully crafted to be strong and durable. The limbs are faced with caramel colored glass and backed with a brown glass. It’s old-school look doesn’t give away its modern technology. The bow uses Futurewood in creation of its handle section, which resembles natural wood. A manufacturing process creates new physical properties of the wood while retaining its natural beauty. The wood’s natural pores are filled in through a pressurized vacuum, which increases its weight and strengthens the wood. Although it appears to have the original grain and beauty, the handle is virtually impossible to crack or warp. Tips are hand-finished for modern bow strings. Grip is capped with fiberglass accents. Bear Bows are warranted to the original owner. The risers and cams have a lifetime warranty. The limbs are 100 percent covered at no charge for the first 5 years, then at 50 percent replacement cost after 5 years. The bow warranty registration process must be completed and submitted to Bear within 30 days of purchase. There are exclusions, but this bow does have a good reputation backing it. Can I take my Kodiak Hunting? This bow was created with the hunter in mind, but it could be used for target practice or 3D archery. It’s a legendary piece of equipment that Mr. Bear would use today. If you’re into old-school hunting, the Kodiak Recurve Bow is simple, basically just a stick and a string. With practice, you can learn to shoot in a fluid motion much quicker than you could with a compound bow. Kodiak Recurve Bow weighs about two pounds, making it lightweight to carry when hunting. This bow has a draw weight starting at 35 pounds up to 60 pounds. Forty pounds is recommended for hunting, but it’s up to you to determine the right draw weight for you. Selecting a lower draw weight as a beginner can help you learn proper form and make the experience more enjoyable. However, a bow stringer is not included. If you aren’t going to be shooting for more than a week, you should unstring the bow. Stringing the bow without a bow stringer voids the warranty. 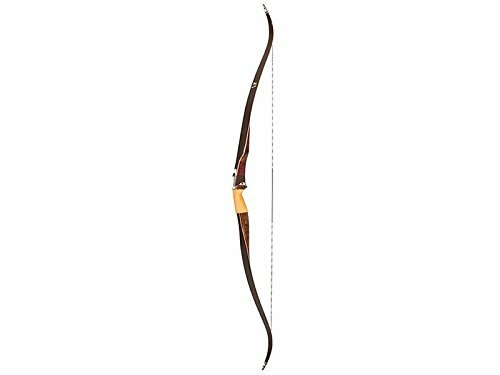 Selections of the Kodiak Recurve Bow may vary due to differences in wood grains and colors. When you order, keep that in mind. Online reviews are generally positive, mostly 4- and 5-star ratings. Most reviewers say that it is accurate, easy to draw and handle, and powerful. One reviewer mentioned that it was so “nice-looking that you might hesitate taking it out hunting.” Another reviewer said that the pictures and videos don’t do it justice. Most reviewers would recommend the product to a friend. Out of 20 reviews, only 2 gave the bow a review less than 3-stars. The negative reviews mentioned that the workmanship wasn’t up to bar. Specifically, the leather handle grip did not appear professionally made. One reviewer called it too glossy. The satin finish would be less glossy, more like a matte finish. Another reviewer replaced the leather grip with one that was hand-stitched, although the company did not recommend this. If you’re looking for a classic bow that Fred Bear would recommend, the Bear Archery Kodiak Recurve Bow fits the bill. It’s generally recommended for intermediate to advanced shooters, but beginners could learn to use it provided they start with the right draw weight. Want to Learn More? Check Out What Other Review on Amazon!